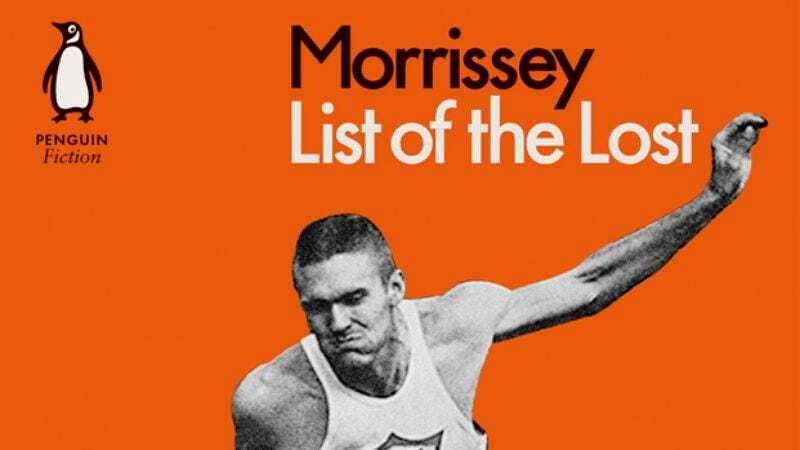 As we so graciously pointed out to you several days ago, while you sat there and didn’t appreciate our solo career, and tried to stick daggers in our backs, Morrissey will release his debut novel, List Of The Lost, later this year. It follows relatively hot on the heels of his very successful Autobiography and his musical and commercial disasterpiece World Peace Is None Of Your Business. (Okay, “Kiss Me A Lot” is fine, but the rest, yeeesh.) It makes plenty of sense that he’d release another book, considering that, in the man’s own words, “it has been more successful than any record I have ever released.” Well that novel now has a very orange cover featuring a man running a race, holding a baton. We can only assume from that limited information that the novel will be about a gloomy, T. Rex-loving child from Manchester who’s wise beyond his years and grows up to make music that touches the lives of millions, before quitting the business to become a track star. Also, there might be torn-up shirts and animal rights. Strangely, considering the impending release date—September 24—published by Moz’s official mouthpiece, True To You, the book is not yet available for pre-order on Amazon’s UK site. (It has no U.S. release date yet.) Yes, I checked because I plan on pre-ordering it.